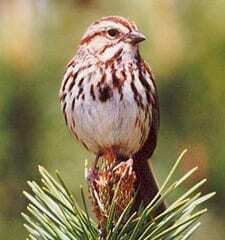 A rich, russet-and-gray bird with bold streaks down its white chest, the Song Sparrow is one of the most familiar North American sparrows. Don’t let the bewildering variety of regional differences this bird shows across North America deter you: it’s one of the first species you should suspect if you see a streaky sparrow in an open, shrubby, or wet area. If it perches on a low shrub, leans back, and sings a stuttering, clattering song, so much the better.